Have you ever heard of Canyonlands National Park? 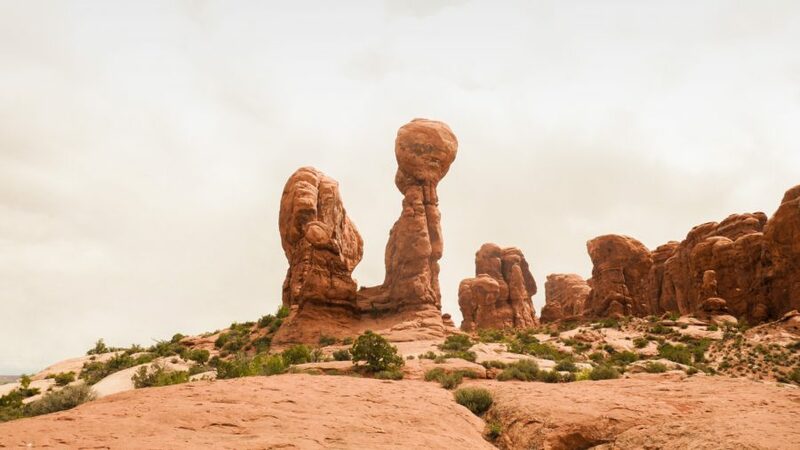 It’s one of the best National parks for hiking in my view and I’d never had until we arrived in Moab, Utah and saw it crop up on Google maps. Canyonlands, Utah is less than an hour away from Arches National Park and is every bit as beautiful. It’s one of many Utah National Parks and the scenery is hugely different from just a few miles away at Arches; something which impressed us both. Who knew the scenery could change so much so quickly?! 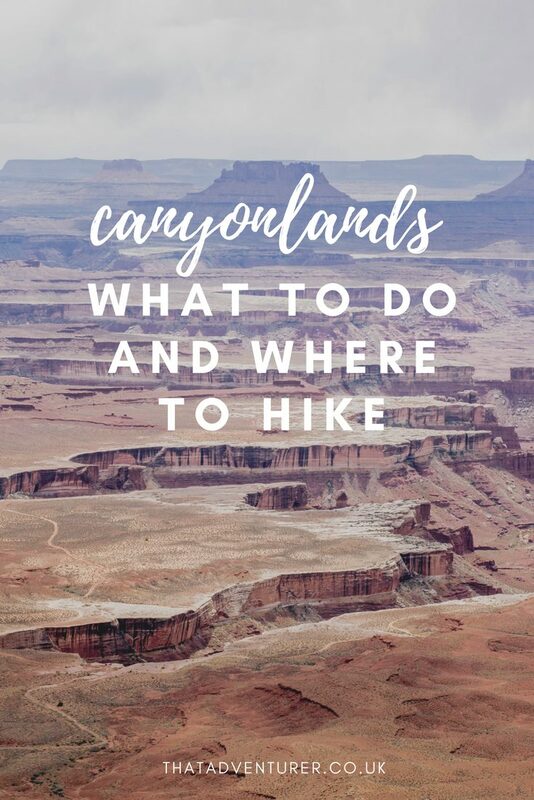 One of the best things to do in Canyonlands National Park is to hike! 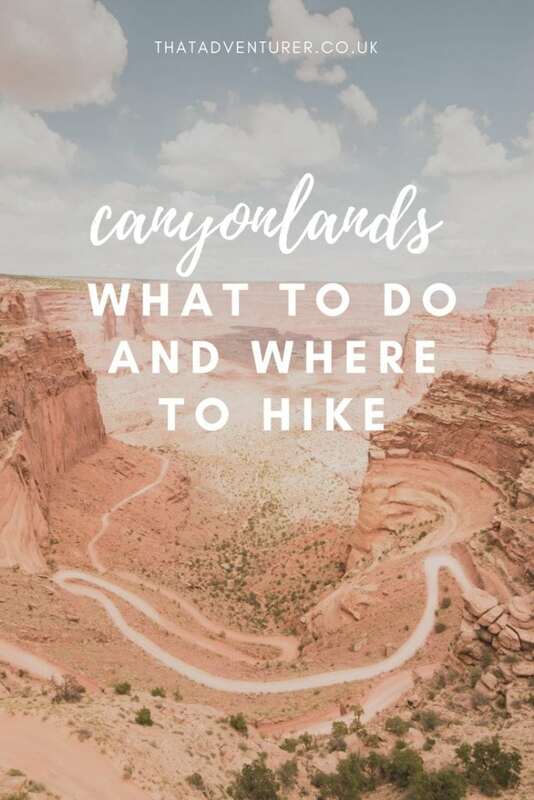 They don’t have to be long but you should do some since there are so many incredible hikes to do in Canyonlands National Park! How big is Canyonlands National Park? How to get between districts in Canyonlands National Park? Canyonlands National Park is in Utah in the USA. It’s one of many Utah National Parks and it’s huge. 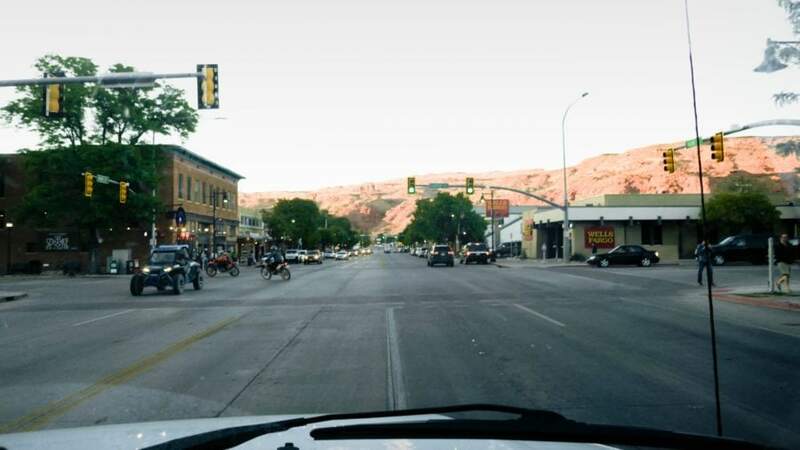 It’s very close to both the town of Moab and Arches National Park. If you’re in the area you should definitely check out both Arches and Canyonlands National Park. Canyonlands National Park is 337,598 acres. So basically, it’s huge. It’s so big in fact that it’s been split into five different districts. These are; The Maze, the Island in the Sky, The Rivers and the Needles, Canyonlands. There’s also Horseshoe canyon, Utah to the north west. You can’t get from one section to the other by car from within the park; you have to drive around the outside because of all the rivers and the depth of the canyons. Travelling between the districts in Canyonlands National Park requires 2-6 hours. 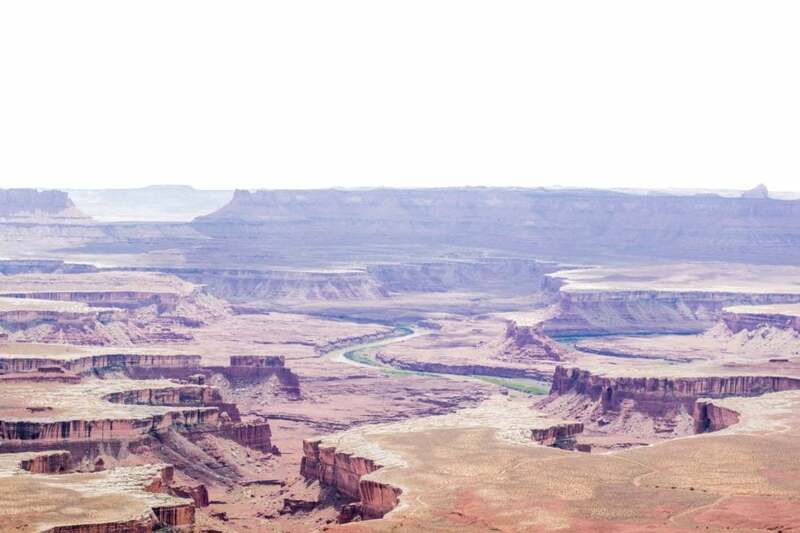 If you’re planning to visit more than one part of Canyon lands National Park. It’s not something you can tick off in one day! As Island in the Sky is closest to Moab and Arches National Park that’s the district we visited. Its proximity to Moab does mean that it’s the busiest section but, having said that, it really wasn’t very busy at all when we were there. It’s still a lot less busy than Arches National Parks so it’s ideal if you’re looking for some quieter Moab hikes. All the districts in Canyonlands National Park have a much more primitive nature than some of the other National Parks we’ve visited. 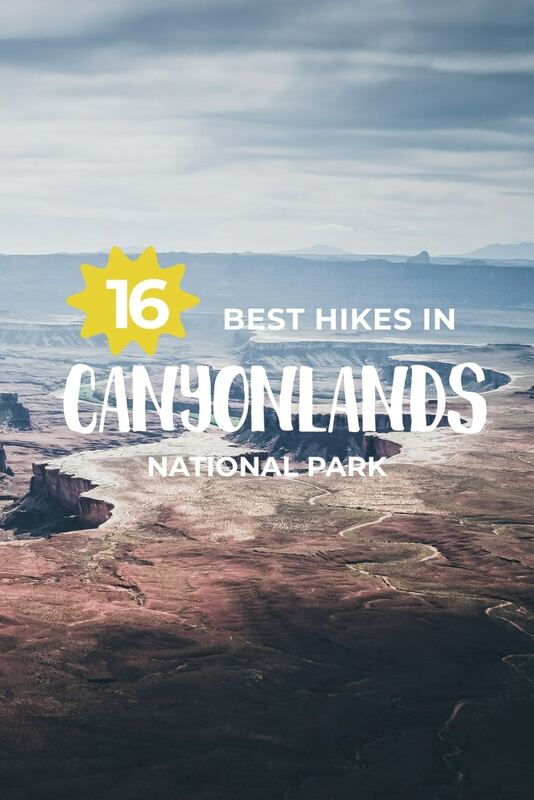 There’s also a lot more wilderness hiking available to those who are up for it – some of these are the best hikes to do in Canyonlands. 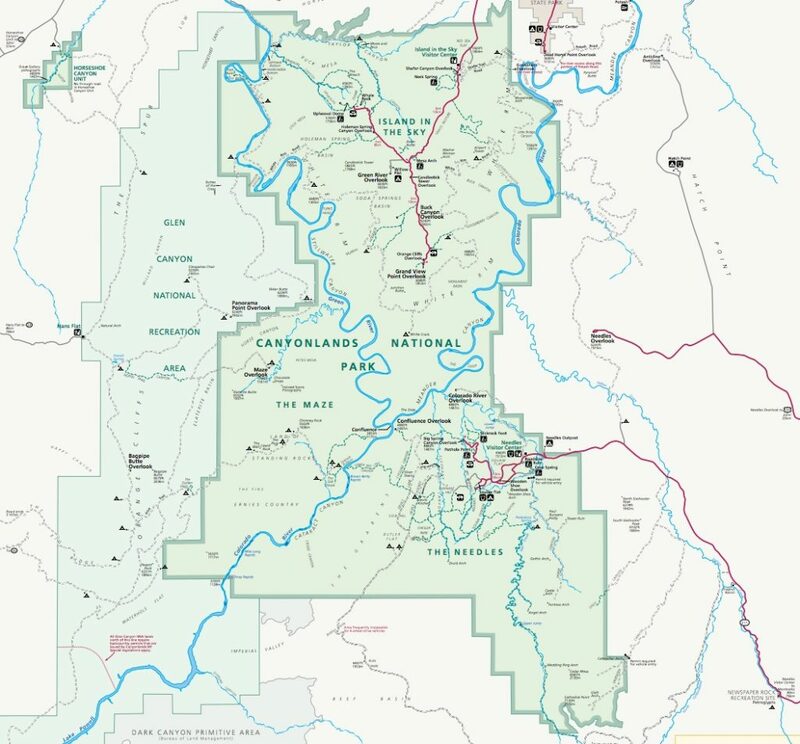 Take a look at this Canyonlands map for an overview of the park and for an idea of the Canyonlands trails. If you’re planning on hiking in the Island in the Sky you’re in for some of the best hikes in Utah! The Island in the Sky district itself is split into two distinct sections. There’s the Mesa Top (the top of the canyon) and the trails along the White Rim Road. The White Rim Road trails are only accessible once you’re in the canyon. You can get here either by hiking down or, if you have a 4×4 you can drive the White Rim Road. The White Rim Road is 100 miles long and loops around and below the Island in the Sky mesa top. Trips take about 2-3 days on average by car or 3-4 days by mountain bike. You’ll need to get overnight and day-use permits to drive this road. You can get permits at the visitor centre in person or reserve in advance online. Follow the cairns (stacks of small rocks) carefully. The trails aren’t that well sign posted so this will be what you need to follow. This short and easy hike leads to one of the most recognisable features in Canyonlands; Mesa Arch. This arch is right on top of the canyon’s rim and is apparently beautiful at sunrise as the sun seeps through the arch. This is probably the busiest spot in Canyonlands National Park. Everyone wants to see this Canyonlands arch, especially at sunset and sunrise. We weren’t there at sunrise but the views from here were beautiful regardless. The White Rim Overlook trail takes you to an east-facing overlook for views of the Colorado River, Monument Basin and La Sal Mountains (these were still snowy when we were there!). This trail is best in late afternoon as both the light, and the heat, are better! One of the best views in the whole of the Island in the Sky district, the Grand View Point gives you exactly that: a grand view. 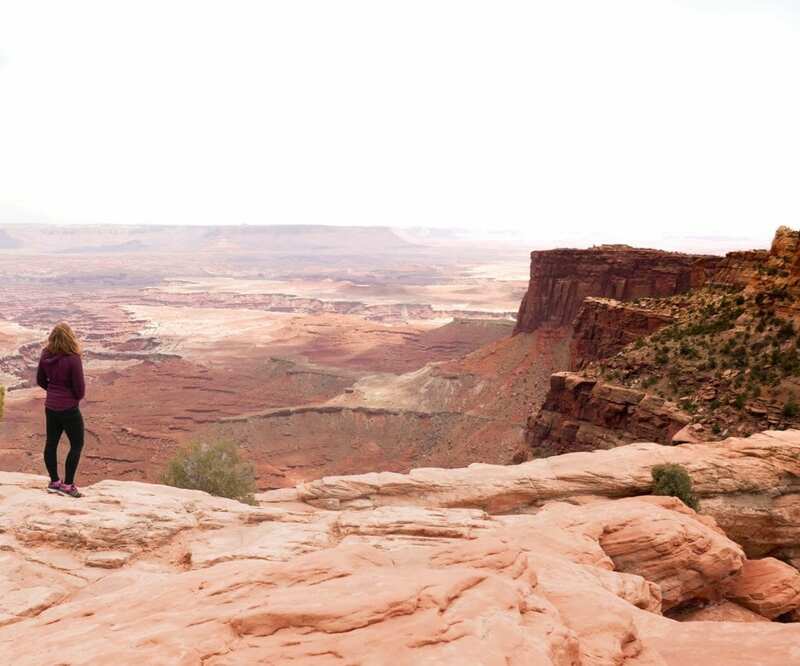 You’ll get spectacular panoramic views as you walk along the canyon edge on this relatively short trail and it’s a fantastic Green River overlook Canyonlands spot. This isn’t the shortest of walks but it’s flat so it’s relatively easy to complete. 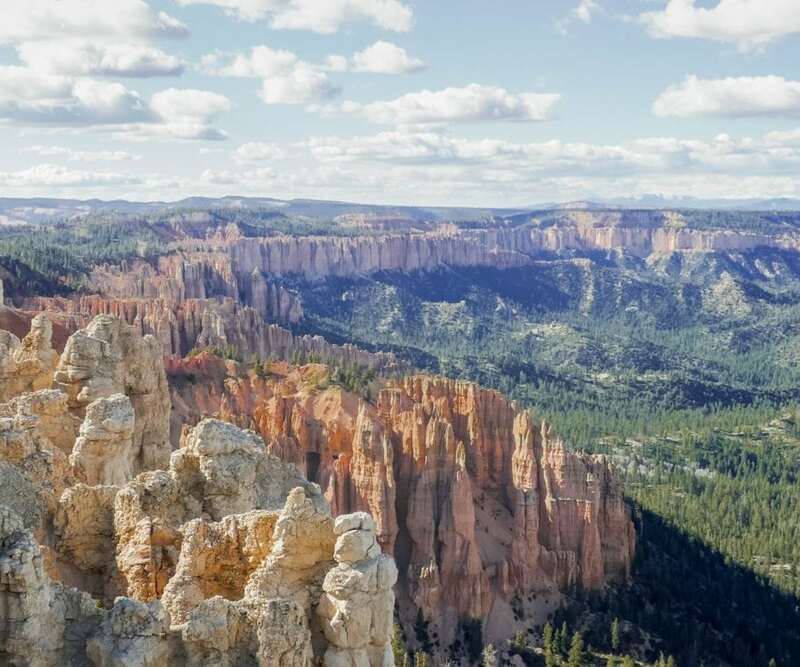 This hike leads past a historical corral on the canyon rim and ends with panoramic views of Candlestick Tower, the Green River and the White Rim Road. See if you can spot any 4x4s on the road below! Although this trail is short, under 1 mile, it’ll probably take you longer to complete than you think. It’s a pretty steep climb down which leads to a clear view into Upheaval Dome. The trail to Whale Rock leads up the side of a sandstone dome. From here you’ll get fantastic views of the Island in the Sky. Watch out though – you definitely don’t want to fall down here! This is a great moderate trail to do if you’ve got a few hours in Canyonlands National Park. You’ll follow a sandy wash which then splits into two paths. The path to the right takes you up towards Aztec Butte for great views over the canyons. The left climbs up the smaller butte then drops below the rim. Here you’ll come across two old Puebloan granaries. Both these routes require you to scramble up and over some rocks and ledges – are you up for it? If you’re full of energy then give the Neck Spring trail a go. It’s a loop trail (which I think is great, no passing the same place twice!) and takes you past historic ranching features. There are also two springs which used to be where cowboys watered their cattle. There’s not much of an elevation change on this trail and you’ll also see plenty of varied plant life. This is the steepest trail in the whole of the Island in the Sky district. You’ll find yourself rapidly descending 1,400ft to the White Rim bench. There are tonnes of zig-zag paths, sheer cliffs and scree slopes for you to tackle. Take it slow and enjoy the view! This trail is pretty challenging and should only be attempted if you’re an experienced hiker. The park says most of its rescues come from hikers on this trail. If you are up to the challenge then it’s rewarding. You’ll follow the canyon around Upheaval Dome and cross boulder fields as well as take a 1,300ft elevation change. Hike this clockwise in order to get more shade in the afternoon sun and take a torch just in case you’re out until dark! 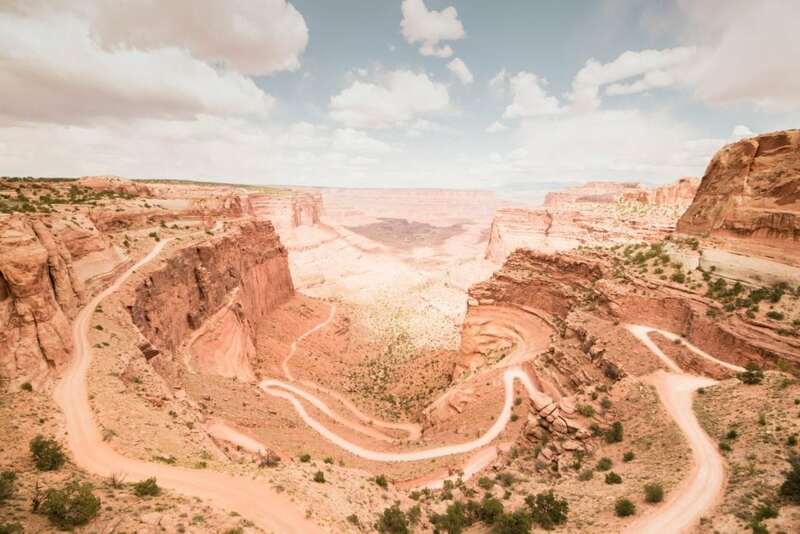 The ultimate trail in Canyonlands National Park is the Lathrop trail all the way down to the Colorado River. To do the whole thing you’ll need a back country permit as you’ll be spending the night down in the canyon. The trail starts by crossing open grassland before dropping 1,600ft into the canyon. You’ll see the La Sal Mountains in the distance and plenty of sandstone knobs on the way. Continue on follow the Lathrop Canyon Road to the Colorado River. There’s not much shade along the way but cottonwoods and tamarisk offer some shade near the river. 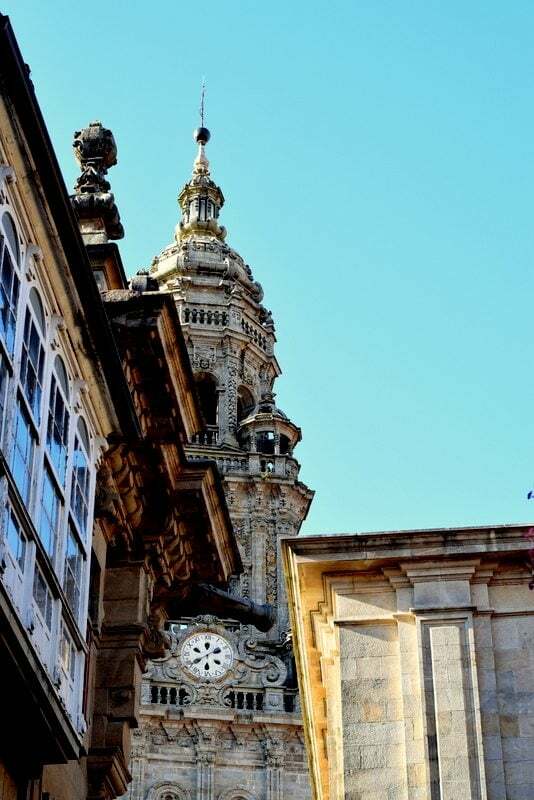 Pack plenty of water, food and suncream! 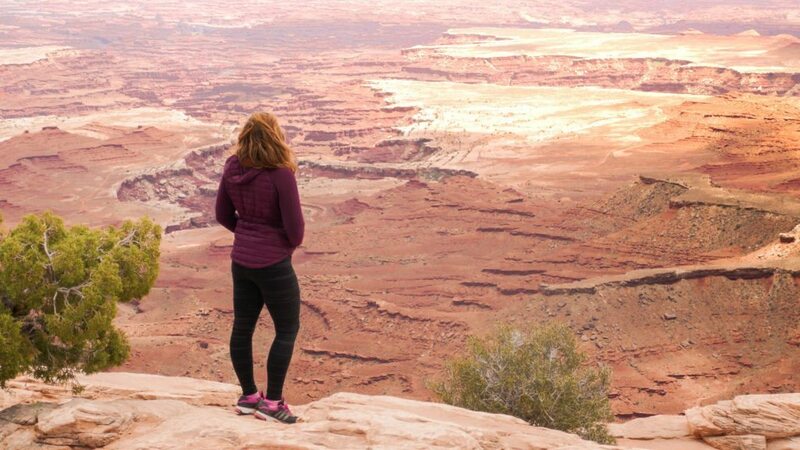 If you’re doing an overnight hike you’ll need to purchase a Canyonlands backcountry permit. You can buy these at the Island in the Sky visitor centre or online. Always carry plenty of water with you. It’s recommended you drink at least 1 gallon a day. Remember you are in the desert. Do not rely on phone signal. There isn’t really any. Wear suncream always. There’s very little shade in Canyonlands National Park so a hat would be a good idea too. Canyonlands National Park weather tends to be hot and dry. Leave no trace. Take all your rubbish with you and leave plants, rocks and artefacts untouched. Stay on the trails, walking off them can damage wildlife. 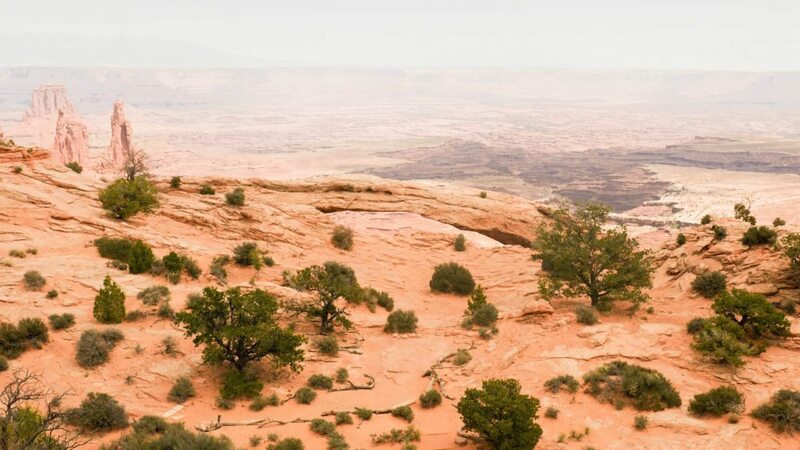 Due to the primitive nature of Canyonlands National Park, Utah you may need to do some camping. Whilst we didn’t camp in Canyonlands I bet you’re in for a treat of a night sky if you’re in Canyonlands by nighttime. If you’re planning on doing some Canyonlands camping then here’s what you need to know. There’s are a couple of Canyonlands campgrounds for those of you planning on backpacking in Canyonlands National Park. Most camping in Canyonlands is backcountry camping, for which you’ll need a permit. However there are two ‘proper’ Canyonlands National Park campgrounds: one in the Island in the Sky district and another in The Needles district Canyonlands. The Willow Flat campground has 12 sites, first-come, first-served and is open year-round. If you stay here you’re super close to the beautiful Green River Overlook. This campsite in Canyonlands costs $15 per site. There are toilets and tables but there is no water at the campground. The Needles Campground has 26 sites and the camping fee is $20 per site. Some spots are reservable in spring and autumn but otherwise they’re first come, first served. It takes roughly 35 minutes to get to Canyonlands from Moab, Utah. It’s a 30 mile drive. Head north on the US-191 and then west on the UT-313. Getting to Canyonlands from Arches National Park is easy too. The drive is just under 30 minutes, just go west on the UT-313.